Family Friendly Gaming was provided a download code for Gunslugs 2 on the Nintendo 3DS. This hand held video game pays its respects to side scrolling shooters from the 1980s. The characters in Gunslugs 2 look like small blocks. They do shoot one another in a variety of violent ways, and there is also blood in Gunslugs 2. Why is there blood in Gunslugs 2? I have absolutely no clue. The action violence in Gunslugs 2 is fast and furious. All kinds of the same type of enemies will make their way toward you launching a variety of weapons at the player. Thankfully there are numerous health items to help the player stay alive. Do not expect to perfect any of the levels in Gunslugs 2. Levels look and feel repetitive in Gunslugs 2. Which means the same strategy works over and over again. Gunslugs 2 shows its indie roots like a boss. Players can also enter certain vehicles for even more destruction and mayhem. Why are we digitally murdering all of these soldiers doing their job? I was never quite clear on that. Players seem to be the aggressor so maybe we are enacting a preemptive strike. It is odd to see one character killing off an entire army in Gunslugs 2. We can rescue other characters and play as them. I liked listening to the music in Gunslugs 2 on the Nintendo 3DS. The game controls well, and it is easy to move around. It is also really easy to die in Gunslugs 2. If you play this downloadable only hand held video game I advise you to take it slow. Destroy each of the buildings to progress to the next level. Slow and steady does win the race in Gunslugs 2 on the 3DS. I also like the different modes in the main screen of Gunslugs 2 (Daily Challenge and Arcade). It feels like walking around a base. 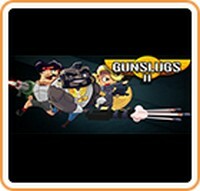 If you are at least a teenager who can handle excessive amounts of violence then Gunslugs 2 may be to your liking. Fans of games like Contra will take an interest in Gunslugs 2. Please note that the old Contra game actually have better graphics than Gunslugs 2.